CEED 2016 Application Form: Common Entrance Examination for Design (CEED) is a qualifying examination for admission to Master of Design (M Des) programmes at IISc Bangalore, IIT Bombay, IIT Delhi, IIT Guwahati, IIT Hyderabad and IIT Kanpur, and PhD programmes in Design at some Institutes. CEED Online Application Form 2016 will be available soon through the official website of the Indian Institute of Technology Bombay (IIT Bombay). CEED exam has been conducting by IIT Bombay every year. 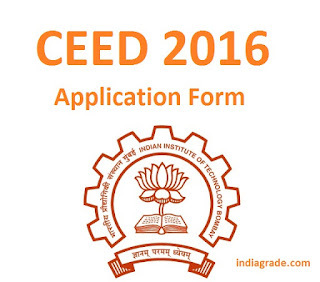 Interested candidate are advised to keep visiting our indiagrade.com website for latest information about CEED 2016 Application Form. Aspirants are searching through the online websites to know the staring date for the CEED 2016 online registration process but the institution will not announced any information regarding the CEED Application Form 2016. Once the IIT Bombay published the advertisement about the CEED 2016 Online Application Form, we will update in our Indiagrade web portal, So you can easily get the instant updates about the CEED online registration 2016. The objective of CEED entrance exam is to assess the candidates aptitude for design such as visual perception ability, drawing skills, logical reasoning, creativity and communication skills. CEED Exam 2016 will be conducted in the following exam centres such as Bengaluru, Bhopal, Calicut, Chandigarh, Chennai, Delhi, Guwahati, Hyderabad, Kanpur, Kolkata, Mumbai, Nagpur, Pune and Thiruvananthapuram. G.D Art (5 year after 10th) with one year post qualification professional experience. Candidates must read the CEED 2016 notification carefully before going to apply for the CEED Online Application Form 2016. If you want to complete the application submission process, you need the following procedure carefully. You should have all the necessary documents with you while applying for the CEED Application Form 2016. You should have scanned copies of the colour photograph, signature, SC/ST or OBC categories certificate, PwD certificate, PwD certificate. The photograph must be taken against a white or a light blue background [640X480 (0.3 Mega pixel)]. The photograph should not be more than 3 months old and you should not wear spectacles with dark or tinted glasses. Please put your signature with dark blue ink on a white paper and only JPEG format will be accepted (800X300). Please make sure that the above files are tagged with your application number as specified in below. Candidates should do the online registration process to fill the application form by clicking the below given link. You must provide a valid mobile number and E-mail ID. After the completion of this process, A password will be sent to the registered mobile number and E mail address. Click the link on the mail that sent to you for CEED 2016 application login. After you filled the CEED 2016 Application Form, you must do the payment. Applicants can pay the application fee through SBI Collect using Internet Banking, Credit Card or Debit Card. You should use your application number as a reference during the payment. Once the online payment is successful, note down the SBI collect reference number and the bank reference number. NOTE: Donot refresh the page while the payment is processing because it leads to double payment. Now you should login into the website using the registered email address and password. You must fill the personal details without any error. Then choose the examination centre and enter the payment details. Upload all the required necessary documents in prescribed format. Check all the details entered in the CEED 2016 online registration process. Finally submit the CEED 2016 Application Form.